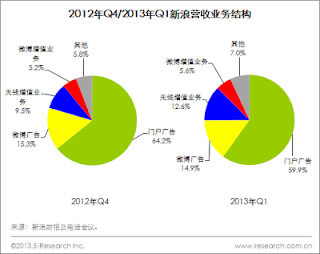 The ad revenue of Sina Weibo was 18.8 million USD, and 34% of them were from mobile ad. Sina published the performance reporting in the first quarter few days ago, but some number of Sina Weibo was also become clear with this. About 73% of their revenue were from advertising, but this reporting emphasized that their revenue of besides ad was rapidly increasing. I think that this phrase includes their will or wish to expand the revenue from that area. This graph said that the total revenue of Sina Weibo contributed about 20% to the all revenue of Sina. Sina is now mainly focusing on the Weibo business, but it can be said that this graph proved the result that Sina Weibo made a certain contribution. Alibaba joined the Sina Weibo team last month, but which action will they execute together from now on? Let's keep attention to their action as before.